Camping in and of itself is a rewarding experience. So is spending time with your dog. Put the two activities together and you will have memories to last a lifetime, with beautiful vistas and a stalwart companion eager to enjoy your company. Before tackling a long, hard trek to a distant campground, make sure your canine camping companion is fit for the trip. Start slow with longer walks; throw in walks that require extra endurance such as hilly trails and paths with lots of variations in terrain. Challenge the pup moderately every week, trying out new activities and being sure to reward the pup for successes. Do not punish for failures, just be patient and keep trying. Pooches are generally eager to please and will eventually get the hang of it. 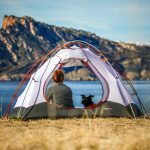 When planning a camping trip with a canine, it is vital for the pup to have mastered a few especially important commands and to be pretty reliable on a few others. Coming when called is, of course, an essential. Sit or lie down and stay can help if come is a little shaky. You can give the hand signal and call out the command and have the pooch wait for you to come to it if the pooch is not so great at coming when called yet. Leave it or drop it are important commands for when the canine has picked up an undesirable object. Heel or walk nice make for a relaxed hike without the pup lunging at the lead. Reinforcing and training commands are also simply good for spending quality time with your pooch, exercising both of your minds and reaping the benefits. Your pup should always be kept up to date on disease prevention treatments and shots. Some RV parks or campsites will even ask for the documentation for such preventative measures, so having this paperwork handy is a great idea. If you are traveling across national borders, you will definitely need proof of rabies vaccination. Basic first aid for your pet is a good idea for knowledge to have at the ready when you are going to be far from civilization and in places where paws can be cut or hides pierced by thorns or rocks. Wounds should be cleaned and dressed immediately. If a bite or sting has happened, you will want to be prepared for these eventualities as well. Do not panic. Stay calm, be prepared for tricky situations, and have a first-aid kit on hand. Get your pup a harness or pack for lightweight essentials; have one that has good reflective tape on it for safety. Consider boots for the pooch if the terrain will be rough or the ground especially hot or cold and icy. Musher’s wax can also help if you and your pup are not ready to try boots yet. When building up endurance, be sure to practice with the gear the pup will be expected to wear and carry.